Very sad that all of these species that have evolved over millions of years surviving bush fires, ice ages, rising sea levels and hunters and in a few short decades will be gone forever. In the Kimberleys there isn't even the threat of development and roads as we have around the coastal areas. What are Governments Doing about This Situation? Governments are well aware that we have the world's worst record for species extinction and 2010 is the Year of Biodiversity yet what is changing? Not a lot. On the 4th September 2010 I attended a lecture by Shane Ruming of Dept. Environment, Climate Change and Water in the Tweed Shire council building. He presented an impressive slide show outlining the Biodiversity Management Plan for the Border Ranges and Northern Rivers. The purpose of this plan is to conserve the rainforest and its species (see http://www.environment.gov.au/biodiversity/threatened/publications/recovery/border-ranges/ ) The emphasis was on removing invasive weeds to help the native species survive. But will they? DECCW did not address roadkill reduction methods nor the need to curtail domesticated cats and dogs from roaming. For that you have to go to another Plan. Tweed Council is not doing enough to address roadkill or cats and dogs that are abandoned and left to fend for themselves in the bush. A friend of mine reported 30-40 cats abandoned on a property yet council refused to act. Another neighbour of hers is breeding dingoes with German Shepherds and letting them run in the bush and council again refuses to do anything about this individual. In an attempt to control the devastating impact on native animals by feral dogs, council is laying 1080 baits on council land and landholders are delivered 1080 baits free on request. Is 1080 good for the environment? Hardly. This poison is banned in almost every country of the world except Australia and New Zealand and virtually outlawed in the US since 1972, 1080 should be outlawed in Australia, not only for its cruelty but also because we simply do not know what might be the long term effects of continually pouring substantial amounts of this poison into the environment. Then there is the question of trail bikes - in spite of numerous complaints some of the audience noted that no fines were given to neighbours driving these environmentally destructive and stress-inducing vehicles. DECCW was generous enough to have a stack of free books each with a CD in the back. The acknowledgement page credits hundreds of people for contributing to the plan so it must have cost quite a bit of money to produce. The detail and complexity of analysis in this plan backed by many pages of references was impressive and staggering to any layman. 'I appreciate you have actions that you are taking, but can you explain in practical terms exactly WHAT is DECCW doing to implement this Plan? After more mumbo jumbo skirting around the issue and generally evading what I thought was a clear question, he asked me if that answered my question to which I replied with an utterly puzzled and shocked expression on my face while shaking my head. At that point the whole room burst into hands waving in the air with more questions in a similar vein. Within minutes the speaker realised he was way out of his depth and utterly lost. Perhaps he was not warned that the local residents in this, the most biodiverse parts of NSW if not Australia, were extremely passionate about protecting their environment and frustrated at the lack of local council and government support. Just last year we barely survived a World Championship Rally tearing through our National Parks, World Heritage areas where endangered species and vulnerable koalas were trying to breed in peace. And earlier this year the boxing gloves were out once again to try and stop our local council putting a dam in Byrrill Creek where 45 threatened and endangered species' homes would be destroyed. We are still waiting for the decision on this one. Another battle we have been fighting is trying to stop a major development on the coast providing homes for 80,000 people in the largest remaining koala colony in Tweed Shire. This proposed development has no provision for overpasses, underpasses or exclusion fences on the proposed six-lane freeways to protect any koalas trying to connect to other areas of their territory. It would permit residents to own dogs and plans to build a golf course in the area where the koalas are supposed to live (as if carcinogenic, neurotoxic sprays on the grass are going to help them survive much longer). In the last year we have seen four historic trees all over 100 years old felled by council, some of them healthy trees, some of them damaged by council workers. Recently a 116 fig tree at Chinderah Tavern has become the subject of another potential tree felling due to a very heavy cactus growing on one of the branches and causing it to fall. A national champion tree arborist examined the tree and said it is perfectly healthy and did a sit in when the chain saws arrived last week which drew media exposure and more protesters. Meanwhile the tavern proprietors claim it is unhealthy and must get the hench. And so the fight goes on. We are tired, very tired and burned out. Every week there is Landcare and replanting trees, endless meetings for No Rally Group, Wildlife Carers, Environment and Greens groups, Team Koala, Water Options Group, fund-raising groups and Community Voice to develop new candidates for the next council elections on top of submissions to write for plans on public exhibition, speeches to write to present to council at community access, attending council meetings every month and writing letters to the Editor of local newspapers. Oh and did I mention we are not paid for our efforts? So it would have been good to hear Mr Ruming say that our good government Department of Environment was going to use funds to actually DO something to help our biodiversity. to put pressure on councils to apply for funding to actually do something. It wouldn't be so bad if councils and governments actually listened to us but the sad fact is they rarely do. The result is that all of this drags on for so long and meanwhile .... day by day ... our species become extinct. It seems to me, and I could be wrong, that since DECCW has the funding shouldn't THEY be doing the actions instead of passing the buck to councils, other government departments and ultimately us, the unpaid plebs? It was very helpful for me to talk to you the other week and again my apologies for taking so much of your precious time. 1. As you know many animals are killed on the road. I realise it's not physically possible to put underpasses on existing roads but overpasses should be possible. For example on Kyogle Rd past Uki there is a great deal of roadworks going on with bush on either side where wildlife would inhabit. Are there going to be any overpasses included in roadworks there? These may be outside your domain i.e. transport authority so please let me know if so and who to contact. Simple animal crossings could be constructed of roap configured as a ladder as possums, bandicoots and koalas would traverse that. This is something that would not cost very much money and could be implemented widely without too much disruption to traffic. 2. Purchase a building to be used as a wildlife hospital and pay specialist wildlife vets and staff to work there 24/7. At present carers have to drive to Currumbin which is costing a lot in petrol and stressing out the injured animal unnecessarily. Yes this would cost a lot but didn't TSC receive a large biodiversity grant? It appears most of the funding is being used on bush regen and control of Indian Myna birds. TSC is spending millions of dollars on other programs, why not wildlife? It is worth a lot to the shire due to our ecotourism industry which is growing, but not if we lose them all due to roadkill! 3. Supplement wildlife carers for any costs incurred in rehabilitating injured animals (food, veterinary fees, medications, petrol, equipment). I realise this has never been done before but since many carers are on a pension they often sacrifice their own food requirements to look after the animals or buy a cheap type of food that is not good for the animal instead of buying the best food for them. Alternately, carers work full-time which limits their ability to care for wildlife. I have come across injured wildlife at midnight only to find that no carers wanted to help as they had to get up early to go to work. 4. The other problem is dogs, not just feral dogs but also dogs owned by people who let them run wherever they want on their property in the bush, especially at night. Could there be signs along rural roads as to what the fine is should people be found to let their dogs roam? This would serve as a perpetual education for locals. A better solution for people with dogs (and cats) would be to have dog and cat runs where the animal could run around in an area and be in the elements day and night if they chose to be or come into a sheltered area such as a house. These runs could be constructed of recycled materials by people working for the 'dole.' If runs weren't so expensive I am sure more people would have them as they want their animal to be happy and safe versus being locked up all the time. 5. It's good you are having more road signs urging people to slow down at dawn and dusk in order to avoid hitting wildlife. As I mentioned, many people are unaware of the possible presence of joeys in marsupials' pouches and if they were better educated more people might stop to check. Could there be an ongoing education of the community via Tweed Link? That is just a few ideas for now. Please let me know if you think any of these are feasible. Five weeks passed and no reply. The officer was at the DECCW lecture I described above so I said hello and he apologised for not answering, explaining that he passed my email around to other officers for comment. Apparently they nixed the idea of rope overpasses for koalas claiming they didn't work. I pointed out that they do work for possums and other animals however. His comment "Ah but possums aren't a threatened species." That is exactly the attitude that is causing 'sleeper species' (today's common species that become tomorrow's extinct species - coined to by Dan Ramp, ecologist from University of N.S.W.). 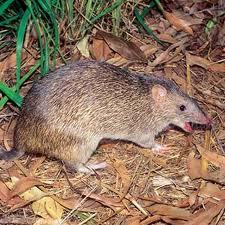 The most common animal I see killed on the roads is bandicoot, followed by possums and snakes. Even wallabies are seen more and more rarely as threats from habitat loss, cars, packs of feral dogs and stress take their toll. This same officer responded to a question from the audience about logging that was supposedly happening in koala territory, Reserve Creek, Round Mountain. Whether it is or not, his response mystified me - "Logging is the least of my worries when it comes to koalas". Hello, koalas live in trees, trees being felled often with them in it with no attempt made to remove them first, killing them. Funny, I thought ecologists agreed that habitat loss (which would include tree felling) is the #1 threat to koalas? With less than 200 koalas estimated to be left in the shire shouldn't we be doing everything possible to save every single one? While we can say that every tree counts, every animal counts too, whether it is threatened or not because a vibrant and healthy ecosystem depends on having as many players as possible. The more native animals, the more manure (the good kind, not nitrogen loaded cow manure) for the soil. The better the soil, the more plants. The more plants, the more oxygen. The more oxygen, the better environment for humans to live in. Additionally, the more fauna the fewer insects which would raze our crops and make our lives miserable, forcing us to use carcinogenic chemicals that in the end kill us too. If there was real community engagement on the part of DECCW or Tweed Shire Council, they would be coming to us and asking us, the people on the ground, what are the issues and how can we find solutions instead of spending possibly millions of dollars on elaborate power point presentations, publications, CDs and websites. Then our wildlife MIGHT have a chance. All that money could instead be put to immediate use with constructive results or better yet, paid to locals who have invested hundreds of hours compiling reports UNPAID for their services. The gross inequity of this (distribution of funds being given only to those employed by government while expecting citizens do much of the work) is abuse of democracy of the worst kind. Further insult is heaped on top of that because while governments have the funds to implement actions and the ability to make laws that are necessary to protect our environment, they refuse to do so effectively and thus we are forced to watch with broken hearts our dying native species. Ominous consequences of human "success"
Many economists have argued that there is no upper limit to human population growth, and that finiteness in resources is meaningless. Prosperity can be had by all. This is how ideologies are, and the nature of economics is one dimensional. Population growth is good, so keep adding more people and simply ignore any environmental context! Although our planet's human "carrying capacity" is unknown, it is undeniable that non-renewable resources will eventually be used up. As such, renewable resources have been and will continue to be plundered until they no longer exist. Pollution will take its toll. Eventually, economists and humanitarians say, "market forces" will determine how big the population gets. We have run out of resources in the past and have always found something else to replace them. Compared to most, the human species has been remarkably successful, despite droughts, tsunamis, famines, floods and fires. Recent economic systems have played a significant roll in this success. However, economic systems also provide an opportunity for a few individuals to pursue self interest at the expense of the many. Among the population, instant gratification is the rule of the day. Following each mass extinction in the past, there was a rapid radiation of new species. Extinctions are a normal part of evolution. The generation of new species requires enough time for adaptation to take place. The rate of ecosystem change is now so rapid that the species which might otherwise have survived a mass extinction may not be able to adapt to the new world. Our world has changed too fast, and too many ecosystems have been damaged. In very cold environments, larger animals fare better. The population of a large "animal" - human - has never before reached such dominance in the ecosystem. My understanding is that 1080 is naturally occuring in the West Australian Gastrolobiums or poison pea. It does occur in other Australian plants but it is predominant in south western Australia. As a result WA wildlife (in the SW area) has a higher level of natural tolerance to 1080 than wildlife from the remainder of Australia. The laying of 1080 baits in the southwest of WA is highly selective against non-native animals, such a claim can not be made in other parts of Australia. Furthermore there is evidence suggesting that some species of birds such as bronzewing pigeons in WA feed on the poison pea and store 1080 in their bones. Foxes and cats that feed on these birds could therefore become victims of natural 1080 baiting. I recall hearing a radio program within the last two to three years or so discussing 1080. I don’t recall the name of the program and have not done any research into the issue since so I am not saying the information is necessarily reliable. What I do recall was the following message which at the time I found extremely fascinating and undoubtedly that is why the memory has stuck with me. The active ingredient in 1080 is apparently a naturally occurring substance in Australian native plants in relatively high concentrations. Sadly I cannot recall which plants but have a feeling it was grasses. Our native grazers, I believe marsupials were mentioned have a natural high tolerance to the ingredient and thus can tolerate doses which would be lethal to imported species such as the European rabbit and fox with no resistance at all, which are the prime target for 1080 baits. It is this feature which makes 1080 such an effective bait against the target pests. Even our local Carnivores and predatory omnivores have a evolutionary resistance also due to direct ingestion of the chemical in their diet ( omnivores) or by consuming undigested gut contents of prey animals (carnivores). There was no suggestion that this resistance gave a guaranteed immunity but excesses of many common dietary components , even plain old water can be lethal if consumed in sufficient quantities ( by humans at least). From a different source I have long had the understanding ( 30 odd years or so) that there is no antidote for 1080 and it leaves no trace in the bloodstream of its victims hence its distribution is tightly controlled and Joe Public can only obtain it in pre treated bait form. Commonsense really, as if it were available to just anyone in a bottle or syringe the non traceable and no antidote aspects may prove just a tad too tempting to some people with annoying relatives or other acquaintances. I stress again I cannot attest to the validity of any of the above so don’t shoot the messenger. Perhaps there is someone out there with greater or more certain knowledge or just more time to do the research. If the above understandings were true it would certainly explain why 1080 is banned in most other countries and not here due to the uniqueness of our native flora and fauna. Would appreciate feedback from anyone out there who is better informed than me on this subject.